This route takes you north from Kos to the beautiful islands of Kalymnos, Leros and Patmos. As soon as you arrive you meet your fellow sailors and the crew, we divide the huts and we give you the first instructions about your live on-board. You then have the rest of the day to explore the island or relax on the beach. We sail from Kos to Kalymnos. Kalymnos is a lively island known for its spectacular free climbing spots. We moor in Vathi, a fjord-like bay with steep cliffs. We eat in Poppie’s traditional restaurant. We sail north to Lipsi. First we make a stop at the Blue Lagoon for lunch and swimming. Lipsi has become an important stop for yachts, there is a good supermarket a number of cozy bars and restaurants. The old city center is within walking distance, and is definitely worth exploring. Today we have a shorter sailing day ahead of us. This day brings us to Arki Along the way we have time for an extensive lunch and swim stop in one of the numerous bays. 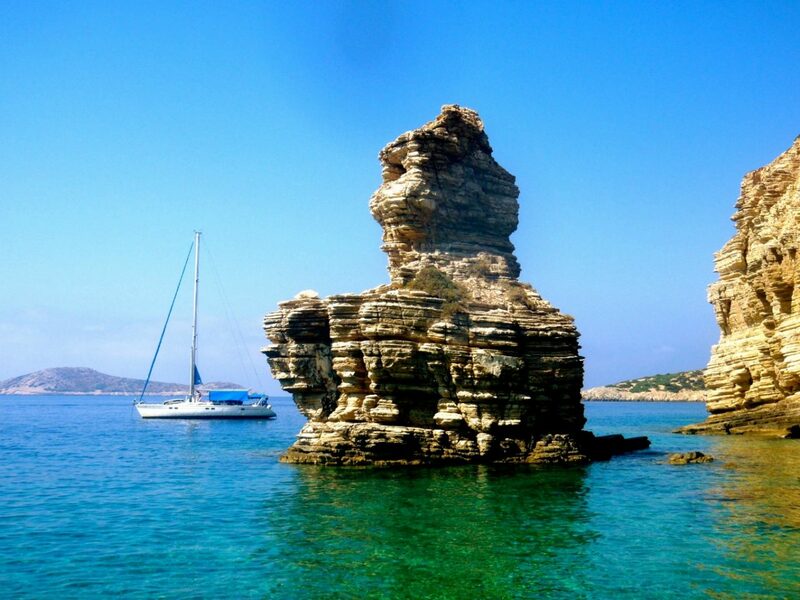 From Arki we cross over to Patmos and anchor in the bay Gricos on the south side of the island. From here a walking path goes up to Chora and Scala. Upstairs, next to an impressive medieval fortress, is a famous monastery. We are preparing for our route back to Kos. With the wind we sail to Kalymnos where we will experience a Caribbean night in Pirate Bay (Emporios). Staveros and his brother will come to collect us with their pirate ship and we eat in their restaurant. We have to get up on time, as we have a long sailing day ahead of us; back to Kos. If we have time, we make a short swim stop on the island of Pserimos. We will moore our boat on our usual spot at Kos marina. Day 8: </ strong> Unfortunately this is the end of our sailing trip. However, next a nice tan you also take a suitcase full of beautiful memories home with you. The routes offer a wide variety of harbors, bays and beautiful views. The routes described are subject to change and can be adjusted due to weather and other circumstances. This is always at the discretion of the skipper. Unfortunately this is the end of our sailing trip. However, next a nice tan you also take a suitcase full of beautiful memories home with you.